Sick of politics? Sick of being told to vote? Sick of being told your Facebook/Twitter/actual-in-the-flesh friends have voted? Sick of complaints, or complaining, about all of the above? Want to dedicate some emotional energy where it matters? Then click over to this article, read it. Go ahead, I’ll wait. Seriously, click it! 1. Mourn the painful, cruel and prolonged death of an innocent daughter at the angry, ignorant hands of her own parents. Let your heart be broken by what breaks His, regardless of what you call Him or how you come to Him. 2. Mourn the loss of the other 940+ women killed last year in Pakistan for similar crimes. That’s about three a day. 3. Celebrate your right to vote, especially if you are a woman, celebrate the fact that if your candidate loses you won’t be hunted down for being on the wrong side, celebrate that we will have a peaceful transition to power, no matter who wins. 4. Determine that you will work to find a way to make this a better world for girls, for boys, for innocents, no matter what party you identify with. You will teach your children differently, you will teach them to love, to value others, to respect differences and fight for justice. You will look for opportunities to stand up for what is right, and give actual money that actually makes a difference. 5. Be deeply, deeply grateful for what you have. We have so much, and so much of the world has so little. Don’t you dare be sick of it. Posted in Uncategorized and tagged 2012 Election, Politics, social justice, society. Bookmark the permalink. 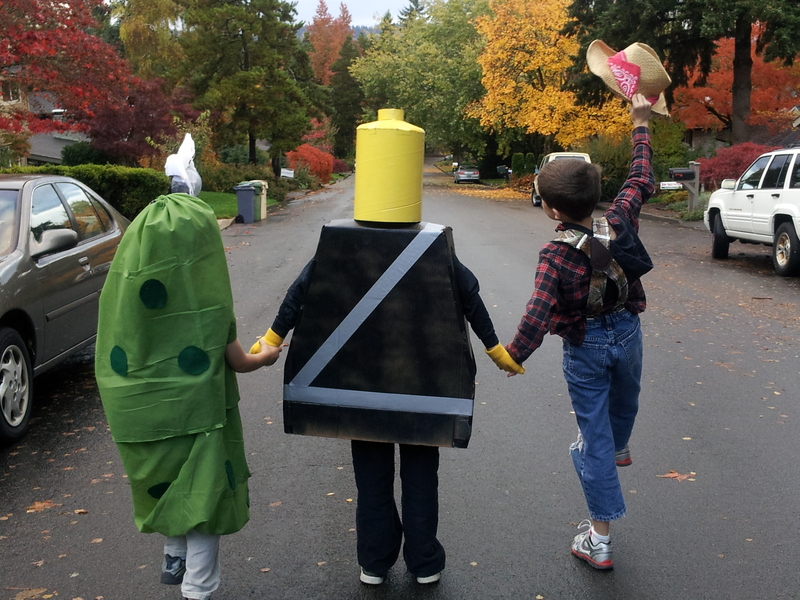 So, a hillbilly, a pickle and a Lego man walk into a bar……. But yesterday was one of those magical moments when the parenting stars align. When it doesn’t matter how NOT artsy or craftsy I am, or how much laundry didn’t get folded this week, or how grouchy I or may not have been the day before. What mattered yesterday was the fact that my sweet husband and I (with an assist from the teenager) pulled off some serious Halloween 2012 Costume Victory. 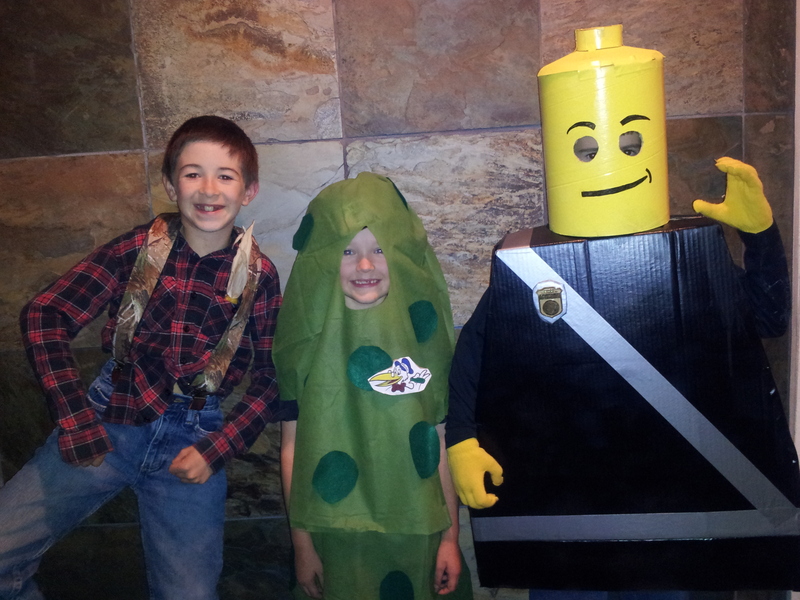 Three boys, three costumes that actually resembled what they were supposed to resemble. The nature of the victory? The usual. No contests were entered, no medals awarded. Honestly, the three costume recipients weren’t even effusively grateful. But when for even a brief moment I feel like I’m doing this parenting thing right, I claim that little victory! Pickle costume – a specific request from the six y.o., as it is his favorite food. If you can’t tell, he was a dill pickle. Not sweet. I don’t know why. I just know I’m eternally grateful that the dollar store had vaguely pickle-colored laundry bags, cause I don’t sew. If you need suspenders, always ask Grandpa. Where else are you going to get a fashionable pair pre-printed with hunting scenes – ducks, deer AND rifles? You can hot glue gun warts on a pickle at a rate of about 20 warts per 15 minutes, if you are not picky about quality and are moderately careful not to glue costume to small child within. Lego man may need to sit down at some point. Check this out before he wears costume to school for the day. Another Halloween has come and gone, and I am keenly aware that I don’t have many years left to enthusiastically craft poor quality costumes, or supervise candy sorting and trading, or scrape sugared-up little boys off the ceiling and pour them exhausted into bed and kiss their sticky cheeks. So forgive me, but I’m going to sit back and savor this for a spell. Pass the Reese’s Cups, would you? Posted in Uncategorized and tagged Family, family adventures, fun, Halloween, parenting. Bookmark the permalink.